There’s a new casino on the horizon and it’s here to stay! 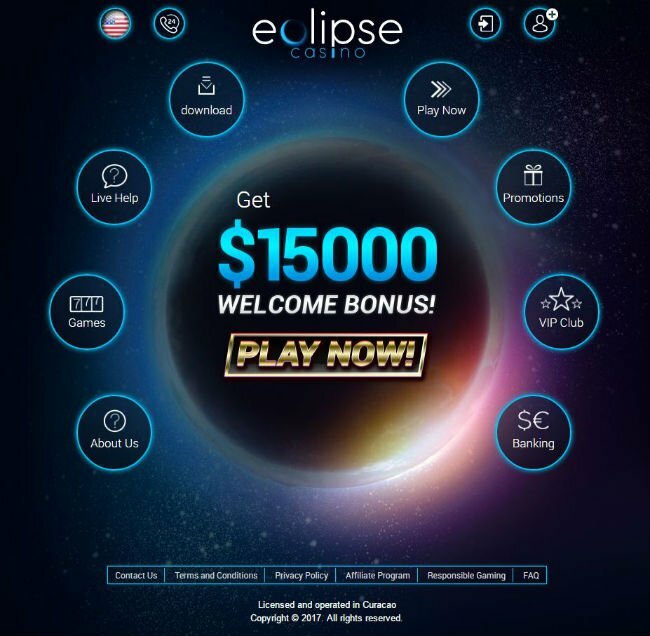 Powered by Rival Gaming, Eclipse Casino offers a refreshing take on classic online gambling with bountiful bonuses, a great selection of games and unique in-house developed slots. Eclipse Casino is a wondrous place and its name speaks for itself. Just like a solar eclipse, this online gambling operator will dazzle the eye the moment players land on this website. People have been inspired and amazed by the astral phenomena for thousands of years, but this casino can achieve the same effect much faster. It does it by showering players with access to exciting bonuses and games that can be found nowhere else. A US friendly operator with a keen eye for the international audience, Eclipse online casino is a major provider of quality games. It has slot machines that can’t be found anywhere else, while also covering all the classics from other genres. There are enough payment methods to convince players that this is the best time to make the transition from virtual to real currency. Eclipse Casino jackpots and high paying games are the ultimate incentive, but the generous promotions definitely help at swaying players. Rival Gaming is responsible for powering most of the games here and out of the more than 200 different games most are Eclipse Casino slots. Some are classic games that players are familiar with from other casinos, but some can be played only here. A couple of in-house developed slots spice things up and make sure that the casino provides unique incentives to its customers. Hole in Won: The Back Nine, Reels Turn and all the finest games from the Rival Gaming I-Slots library can be enjoyed here. Eclipse games have unique themes and quite often they tell a story that will fascinate players just as much as the potential profits. Heavyweight Gold, Reel Crime, Japan-O-Rama, A Switch in Time, Costume Party, Pistols & Roses, Rise of Poseidon, Thunderbird, Major Moolah and Strike Gold are available. This eclectic mix of slots includes a couple of the best paying Eclipse Casino jackpots. You only need to strike it lucky once to change your life forever and the jackpot consists of seven digit amounts. When Eclipse Casino table games are concerned, the collection is significantly smaller but still includes 10 different varieties. These are the games that have plenty of fans in brick-and-mortar casinos and all can be played against real dealers. American and European roulette are featured next to Blackjack, Baccarat, Craps, Pau Gow Poker, Let it Ride, Casino War and Red Dog. 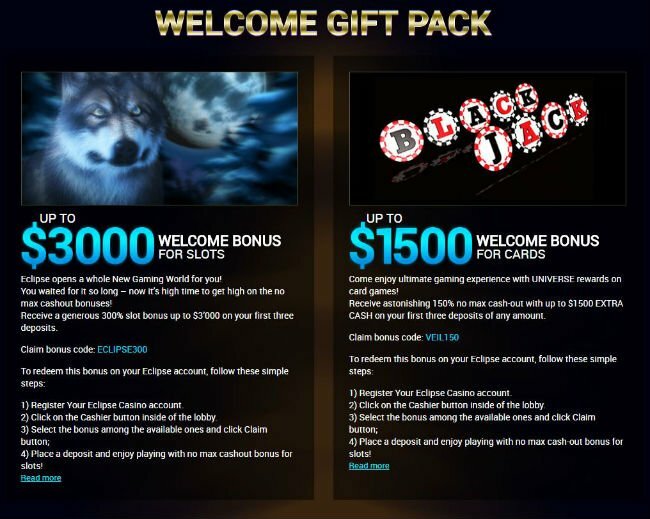 Many Eclipse Casino promotions are dedicated exclusively to them, so players can collect special bonuses. This is also a good place for those who fancy the idea of playing all the popular video poker games. Aces & Faces, Deuces & Joker, Deuces Wild, Double Joker, Jacks or Better, Joker Poker and Tens or Better are on the list. If you want specialty games, then feel free to check out the scratch cards, Bingo, Keno and Sudoku. Rival gaming allows players to use one of the several clients for extra convenience. Nothing says welcome in a more convincing way than bonuses and promotions. Eclipse online casino has plenty of them in large supplies, so you will be showered with their generous offers. The first three deposits result in a combined bonus of $3,000, as they are matched by 300%. Simple math will reveal the fact that in order to collect the maximum Eclipse Casino bonus, one would have to commit $1,000. The play through demands are pretty standard and players need to wager the amount 40 times. Many of their promotions frequently require players to enter an Eclipse Casino bonus code. For the first deposit, you’d have to use ECLIPSE300 to become eligible for the free amount. Only slots and specialty games count towards clearing the bonus, whereas all video poker types and most of the table games are expressly prohibited. One would have to make a deposit of at least $25 to qualify for the bonus, otherwise they will receive nothing when depositing. The next step for existing customers who seek generous bonuses is to take part in the loyalty scheme. The comp point program will reward players who bet real currency and this time all the Eclipse Casino games qualify. The points can be spent on cash, used to unlock branded merchandise or to sign up for exclusive tournaments. They act as rake back deals so they help players decrease the already low house edge. Eclipse Casino customer support is here to help you out whenever you run into trouble but do yourself a favor and don’t jump to conclusions. Check out the FAQ section before, because there’s a good chance to find the answers you seek by yourself. It’s faster and also gives players a sense of accomplishment, while encouraging them to share their insights. When players need the assistance of a specialist, they can get in touch with one via telephone, email or live chat. Eclipse Casino payment methods include Visa, MasterCard, bank wire, Skrill and Neteller. Withdrawals will usually take between seven and ten business days but at least deposits are performed instantly. This is a new casino that accepts American players, so international customers should expect slightly slower cash outs. This is the price to pay to keep things absolutely fair and the good news is that players regardless of location are not charge any commission. Users can rely on their smartphones and tablets to sign up for an account, make a deposit and play their favorite games. When they want to cash out, the same gadgets come in handy and they can be used for speedy withdrawals. 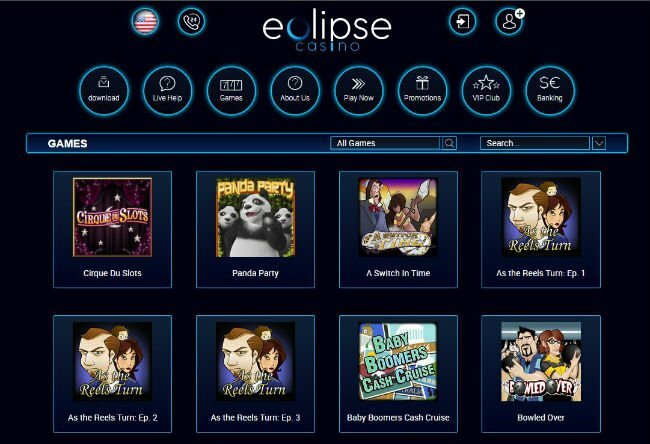 You don’t have to install any of the Eclipse Casino games on your machine, as they can be played straight in the browser. The collection of mobile friendly games is rapidly expanding even though today represents just a fraction of all the titles available. American players will find Eclipse online casino particularly tempting because it projects an image of trustworthiness. Operated and owned by the Blue Media Group, it is a fun place to be and gamble on serious cash. Rival is the main provider of games here, which makes perfect sense given the propensity for US players. At the same time, this otherwise exotic selection of games will appeal to international customers who seek something different. Eclipse casino is yet to prove its professionalism and dedication to cater for an increasingly demanding audience. They are new and ambitious, so even though the gap separating them from industry leaders is why, they could close it in a not so distant future. Meanwhile, players should enjoy the better than average bonuses and participate in as many promotions as possible. If they win one of the Eclipse casino jackpots or thrive at table games and video pokers, they’ll be able to cash out profits securely.